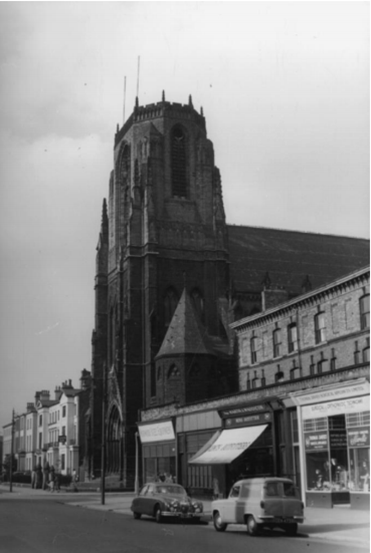 The Holy Name Church, on Oxford Road in Manchester, is a Grade 1 listed gothic revival building of 1869-71 by Joseph Hansom (10 minute walk from Elizabeth Gaskell’s House). Built by the Jesuits, it served as a parish church to a local community of mainly Irish immigrant families until 1960 when the housing around the Church was cleared and the University took over the land. The Holy Name then became the Church of the University Catholic Chaplaincy, which continues to this day. The National Lottery Heritage Fund has granted the Holy Name Church money to repair the leaking roofs, cut out dry rot and restore damaged wall and floor tiles in the north transept area. Alongside this we will clean and conserve over 200 of the original architects’ drawings and make these available online to the public for the first time. The project also wants to hear personal accounts of the church that speak of a cultural attachment to both the space as a building, but also on a deeper level, to the distinct events which happened within its walls and the meaning that they had. The aim of the project is to contact and interview individuals with stories and memories of the Holy Name Church, both from those who attended the church when it was a parish, and from University alumni who were connected to the chaplaincy. Alongside interviews we wish to find photos and other records of the Church to memorialize the church and its community.